I was so excited for the four-day weekend, dear reader, because it meant even more time to watch North and South. But I've been good! And am determined to watch the episode then blog, the watch the next one. It's actually rather refreshing, I must say. I have for you the second post in this mini-series of four. I wonder what made this episode's cut? The second episode opens with a strike looming. While everything seems to be shaking around John, his mother is a powerful moor of strength. We begin to see the everyday life of the people of Milton and learn much more of the Hale's history. Throughout the second episode we get to see the amazing relationship John has with his mother. Her unflinching outlook on life, and her fierce determination to see John succeed, bolsters his own confidence. In many ways, Mrs. Thornton is John's only ally in his life. When seen with Mrs. Thornton, John is allowed to show his humorous side, his thoughtful side, he's able to be a bit of a dreamer. It's two actors acting brilliantly opposite each other. 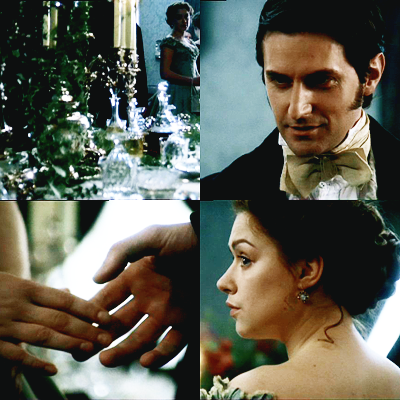 For example, John's conversation with Mrs. Thornton before he goes to propose to Margaret is stunning. As word of a strike flows through Milton, Margaret is interested to learn more -- not so much the how, but why. On a errand for her mother, she ends up at Thornton's mill and has her first real conversation with him.Still struggling with the customs of Milton, Margaret is eager to learn as much as she can so that she knows how to help. And when the strike finally does occur, she stands her ground that helping those who need help is the only way to live. 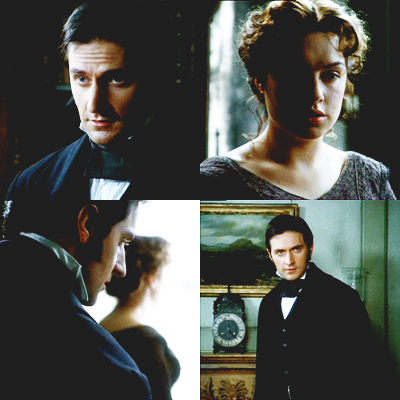 Episode 2 is full of lovely Thornton and Margaret moments and many of them have an intense spark of emotion connected to them. I mean, come on -- those looks John gives with his eyes? SO delicious. The Thorntons always have an annual dinner on the same day, and -- even with the strike -- it brings out the best of Milton Society. And the key topic during dinner? The strike. While Margaret is forced to defend her ideals, the rest of the party looks on, surprised and unsure. When she gets home, Margaret discovers that her mother is very unwell. Desperate to grant her mother's dying wish Margaret writes to her brother, living in hiding in Spain, hoping he will return home to see Mrs. Hale one last time. The dinner party has to be one of my favorite scenes in the whole mini-series. The coloring of the whole scene is beautiful and refreshing and the dialogue is crafted in such a way that tension builds ferociously, but is unable to climax due to the harsh demands of polite society. The strike has continued on long past the Thornton's dinner party and everyone is becoming desperate. Nicholas struggles to help those union men who need more help to feed their families without work. John refuses to go quietly and enlists workers from Ireland. When some of the strikers get wind of the plot, they raid Thornton's mill, hungry for blood. Margaret happens to be there at the time and in rushes to help John against the mob after she pressures him to go and talk to them. Aiming for John, a rock hits Margaret and knocks her unconscious. Once Margaret falls, the strike is broken. Margaret challenges John's outlook on the strikers directly during this scene, and faced with an angry mob and the openness of her convictions, he takes her advice. John trusts Margaret completely, is what we see; and afterwards, he's humbled that Margaret would defend him. He wants to marry her afterward because he can't imagine not being with her any longer. After Margaret's injury at the mill, John wants to make sure she's alright -- and wants to marry her desperately -- Mrs. Thornton, however, doesn't see John desire as much as she sees his sense of propriety. Margaret's actions during the strike were VERY indelicate and imply that her and John have a more intimate relationship. To end gossip, it would only be proper for John to propose marriage. But then he goes to see Margaret the next day and she flatly refuses his advances and proposal. Proposal scenes in general are cringe worthy for me. P&P - can't watch it. This was the first time ever I sat through the entire North and South proposal riveted. Richard Armitage is able to so brilliantly show his emotions subtly on his face that your heart breaks with his own when Margaret refuses him. Margaret blunders more, because she's trying to convince herself that she does not love him. Thus, she doesn't even consider his feelings in her remarks. At the end of episode 2, we've been in Milton almost a year with Margaret and John; we've been through the rise and fall of a strike; we're dealing with the harsh refusal of a hopeful proposal. Good lord, it can't get and worse.